THIS PAPER HAS DISINTERGRATED and copies of the articles are no longer available. MISS Emma Bullet died in Paris on Jan. 31, 1914. sister of Mrs. H.E. Krehbiel. Cincinnati papers please copy. Story is given on another part of page, her coming to the United States at the age of 7, with a widow mother. She lived in Cincinnati. And that she was the paris correspondant for the Brooklyn Eagle. Suddenly at Montclair NJ Jan. 29 Thomas Oakes Conant, in his 77th yr. Funeral Services at the 5th ave Baptist Church on Monday Feb. 2 at 4pm. On Jan. 30, 1914 at her late residence no. 71 east 96th st. Mrs. Mary Roland, widow of the late Col. David Looney, in the 92 yr of her age. Funeral at Church of the Incarnation. 35th st and Madision ave. On Monday Feb 2, at noon . Memphis & Lousivlle papers please copy. On Jan, 31 at the residence of her daughter, Bristol, Tennesse, Margaretha Dorsey Newson, widow of Joseph Morrison Newson, in the 101 st year of her age. Funeral private, at Westminster MD. Philly, Baltimore, Washington and Atlanta papers please copy. At his residence, no 343 Centre Street, Orange NJ on Jan 32, 1914, William Runkle, in his 69th year. notice of funeral hereafter. On Friday Jan 30, 1914 Cassie Hope Sherwood, wife of Thedore H. Sherwood. funeral services at her late residence no. 114 west 123d st. on Sunday at 2:30pm. Story on Cardinal Gennari dying in Rome. Story of Ex. Gov. J.A. Beaver dying. Obit of Edward J. Macgrotty of Glen Rock NJ. age approx 70. He was a member of the 22nd regiment in which his hon was a Major. he was a past regent of Harlem council of the royal acanum. He came to this country in 1844 at the age of 16 and married Jessica Stanley Carr in 1872. William & Walter Evans who left Northamptonshire penniless orphans 45 yrs ago for the US are now paying a visit to their native village of Gayton to the delight & astonishment of the villages for both have become influential me. William Evans was formerly head of the James A. Bannister Shoe Company in Newark NJ & now runs a big whole sale ice business in south Orange NJ, while Walter Evans a member of the William Adams Company dealers in linens at no. 22 White st NY. William Evan's son, Walter is in political life in Essex county. Announcement has been made of the engagement of Miss Mary Isabel Coates, daughter of Mrs. Isabel D. Coates of no. 300 west 85th street, to Frank Desmond Sprague, of this city a graduate of Cornell law 1911 & of the College of Civil Engineers. The wedding of Miss Florence Tobin & William Harper jr. of NY will take place here next monday evening. DANIEL D. WHITNEY, EX MAYOR OF THE OLD CITY OF BROOKLYN CELEBRATES HIS 95TH BIRTHDAY. Following a quarrell with her husband, Mrs. Tillie Heller, 23 yrs old, wife of Geroge B. Heller, of No. 159 east 92nd st. attempted suicided last night by swallowing a quantity of lysol. First aid remedies applied by patrolman Fordham Failed and the woman was taken to Flower Hospital NY by Dr. Sackin, who said her condition was critical. the couple who have been married only 3 months are said to have had a misunderstanding, which occured early in the evening. angered at her husbands attituded Mrs. Heller snatched the bottle of lysol and rained it's contents. Physicians at the hospital said that if the woman's life was saved it would be due to prompt action of patrolman Fordham in administering eggs, and make and mustard and water as antidotes. Quincy Mass: the romantic career of Mrs. Margaret Middlemus, an octogenarian ,known poularly as scotch meag, was ended tonight when she was killed by a NY New Haven and Hartford Railroad train at North Quincy. LA: Miss Nanette Warren found in her apartment here last night besided the body of her sister Miss Mary Warren, who physicians say had been dead nearly 3 weeks was placed in the insane ward of the county hospital tonight to await examination by the lunacy commission. Bridgeport Conn: Mrs. Mary Thompson Luguer long wanted here by coroner john j. phelan to tesify as the death of her aunt Mrs. Hannah A. Cross, widow of Ferdinand M. Cross a Former wealthy NY jeweller, returned this mroning and presneted her self for examination. email me for copy if relative. Syracuse NY Isbel Bacon shot & killed his brother Leroy at their home at brodine late this afternoon. ESTIMATED AT 1 MILLION DOLLARS AND $5000 TO A COUSIN AND NOTHING TO HIS WIFE. .
First 3 firewomen are named: Juliet Arden of no. 6 west 91st, Miss Deborah V. Steborah V. Sabscovich of no. 799 jennings st. the Bronx and Miss Charlotte Stollberg of 417 west 54th st.
Wooster Lambert said to be well known in business and society circles in St. Louis, preferred to spend the remainder of his honey moon at the Ritz Carleton in this city rather than linger alone in a cell in the Queens County jail at LIC. Bridgeport Conn. William Webb a rich jeweller of Greenwich, Conn, whose automobile leaped a parapet in Seaside park last night & landed him & a woman companion among some rocks 20 ft below , was remaned for trail in the city court this morning. Bonds for $500 were furnished by Captian Talbot of the Greenwich police. Lillian Noonan, was the young woman in the case, was taken to the ER with a broken arm. She is said by officials at Norwalk, her home, to be the same woman who gained notoriety several years ago in a similiar midnight ride, when she eloped with philip schaub, son of the proprietor of the Brachville Inn, near Ridgefied on that occasion the father's pursuit failed to prevent the couple from getting married. Webb is charge with driving an automobile while intoxicated. Burton W. Gibson the lawyer who was tried 2x for killing Rosa Menschik Szabo at Greenwood Lake will be arrained tomoorw in general sessions upon an indictment charge misappropriation of the estate of miss szabo. Edward S. Malone may be promoted, brother Justice Malone also mentioned. The wedding of Miss Emile June Walker, daughter of Charles Travers Walker of no. 236 Carroll ST. Brooklyn to DR. Harry Mortimer Archer, of this city, Honarary Surgeon of the NY fire dept. will take place on Tues Evening Feb. 17 in St. Matthews Church 84th ST., near central park west, the ceremony will be performed by the Rev. Dr. Arthur H. Judge, and reception to follow at Sherry's. Mrs. Daniel M. Garber, daughter of the bridegroom, will be the bride's matron of honor & Dr. Archer's best man will be his son in law Daniel M. Garber. Miss Florence G Walker, a sister of the bride will be the maid of honor. The bridesmaids will be Miss Kathryan F. Corcoran, Miss May G. Nolan, Miss Marjorie Looney & Miss Alice J. Marratt, Grace Brooks, Daughter of Mr. & Mrs. A.J. Tizley of Brooklyn will be the flower girls. Dr Archer's ushers will be former fire chief Edward F. Croker, Assistant District Attorney Charles F. Bostwick, Dept Chief Joseph Crawiley, Chief Joseph J. O'Relily & Harold R. Miller. Mrs. Daniel M. Garber will give an afternoon reception for Miss Walker on Feb. 11 at her home no. 460 riverside drive. Mrs. Genevieve Schreiner, daughter of the late George Schreiner and Mrs. Schreiner, was married to D. Charles Weghan, of Jersey City, Thursday evening at the residence of the bride's mother, no. 104 west west 121st street. The ceremony was performed by the rev. Edgar Tilton Jr. The bride wore a gown of white satin, tulie & point lace with pearl trimming. the veil was done of lace . she carried a shower bouquet of lillies of the valley and white orchids. Miss Helen Marie Schreiner was her sisters maid of honor & Mrs. Frederick Straug, a cousin of the bride was the matron of honor. Little Genevieve Schmidt, also a cousin of the bride was the flower girl. Thomas Armstrong was bestman. Announcement was made recently made of the engagement of miss beatrice butler daughter of jaems butler of no. 230 west 72nd street to dr. phillip macguire. Mrs. Augustine Banks of no. 117 west 75th st, recently announced the engagement of her daughter, miss adele b. acker to Carleton Overton Pate of brooklyn. Mrs. Theodore Wood of no 495 west end ave, will sail for Europe on Monday on board the Rotterdam. Mr. & Mrs. R.K. Underhill have taken apartments at the hotel Belleclair for the winter. Mrs. J.J. Baruch gave the dansant on Thurs. at her home, no. 706 Riverside Drive, for her debutante daughter, Miss Reina Bl Baruch. Mr. & Mrs. Stephen H. Brown left for Palm Beach for the Month of Feb.
Mrs. Robert Hall McCormick jr. who was the guest of her parents Mr. & Mrs. Henry Lewis Morris returned home to chicago. In Compliment to Miss Althea Gibb, the debutante daughter of Mrs. Walter Gibb, Mr. & Mrs. Jay F. Carlisle will give a dance on Wed. evening, Feb. 11 at their home no. 373 clinton ave.
Cards were issued last week for the wedding of Miss Estelle Fitch, 2nd daughter of Mr. & Mrs. Walter Smith Fitch & Karl Dravo Pettit, son of Mr. & Mrs. Clarence Petit, of Ptitsburgh, to take place on Sat. evening, Feb. 14. There ceremony in the first Reformed church at 8:30pm, will be followeed by a reception at Mr. & Mrs. Fitch's home no 307 garfield place. Mr. & Mrs. Adoph Martin Drosta will give a dance for their Debutante daughter, Miss Natalie Droste, on Monday evening Feb. 23, Miss Droste is a member of last yrs class of Packer. The dance will be given at the Droste home, no. 188 Hewes. Miss Helen Phillips has gone to Philadelphia to vist her brother Edwin Phillips. Mr. & Mrs. T. Witte of Chicago are guess at the Manor. Mrs. Henry S. Sawyer & her daughters Miss Jane Sawyer & Miss Dorothy Sawer of Chicago have joined the cottage colony in asheville. 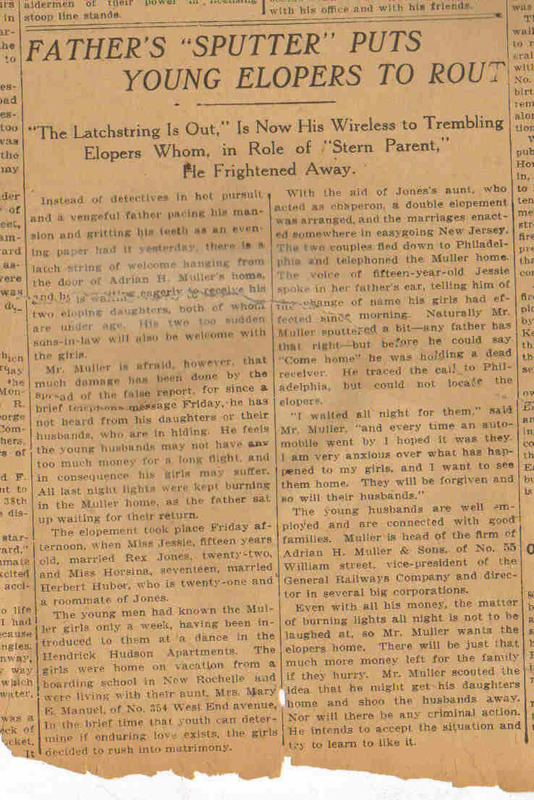 THE ELOPEMENT OF HORSINA MULLER TWIN SISTER OF JESSE AGE 15 DAUGHTER OF ADRIAN H. MULLER TO HERBERT HUBER AGE 21. ROOM MATE OF REX.